It is getting warm out and nothing is worse than heating up your home with the stove and oven when you get home from work. That is why I love me my crock pot. Just put all of your ingredients into your crock pot and have it ready for you after a long day while the A.C. cools you off! So today we are bringing you a delicious and easy meal that you and any guests that you may have over will love! -Place your chicken on the bottom of the crock pot. 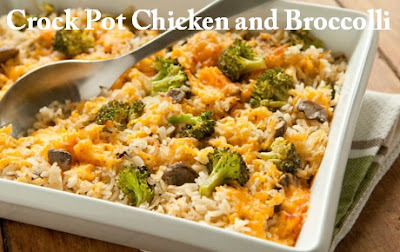 - Right before serving, combine cheese as well as steamed broccoli with your chicken mixture. -Spoon the mixture over your cooked yellow rice and enjoy! Looks delicious. I love chicken and broccoli so this would be a win for me. It's seriously so easy and I've even served it to a few picky eaters and they love it. It's so great for a quick and filling meal. Great for leftovers to bring to work too! Thanks for hosting! Chicken and broccoli and rice are a great combo! Crockpot recipes are the best! I'm totally drooling at this recipe! Right?! Crock pots kinda rock my world! Thank you and yes, it is super simple! Let us know if you try it out and love it as much as we do! This is a great combo and seriously anything in a crockpot wins for me! Thanks, it is so delish! Anything crock pot is a win for us too! I've made this almost exact thing - so tasty. So easy. Right?! It's a total win in our book!